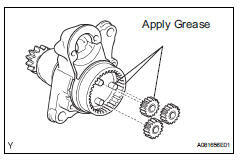 Use high-temperature grease to lubricate the bearings, gears, return spring and steel ball when assembling the starter. Apply grease to the planetary gears and pin parts of the planetary shaft. Install the 3 planetary gears. Apply grease to the plate washer and the armature shaft. 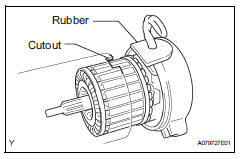 Install the starter armature to the starter commutator end frame. Using snap ring pliers, install the plate washer and a new snap ring. 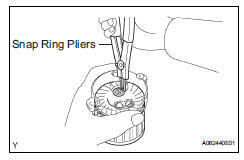 Using a vernier caliper, measure length of the snap ring. 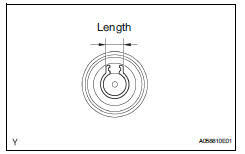 If the length is greater than the maximum, replace it with a new snap ring. Install the end frame cover to the commutator end frame. Insert the armature plate to the starter yoke. 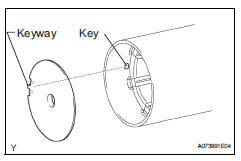 Align the keyway of the starter plate with the key inside the starter yoke, and install the starter plate. Align the rubber of the end frame with the cutout of the starter yoke. Install the end frame to the starter yoke. 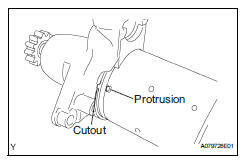 Align the protrusion of the starter yoke with the cutout of the starter drive housing. Install the starter yoke with the 2 through-bolts. Apply grease to the plunger and the hook. Hang the plunger hook of the magnetic switch to the drive lever. Install the plunger and return spring. Install the magnetic switch with the 2 screws. Connect the lead wire to the magnetic switch with the nut.